Hidley worked in Poestenkill, New York, as a house painter, a handyman, an artist, and served as sexton of the Evangelical Lutheran Church. 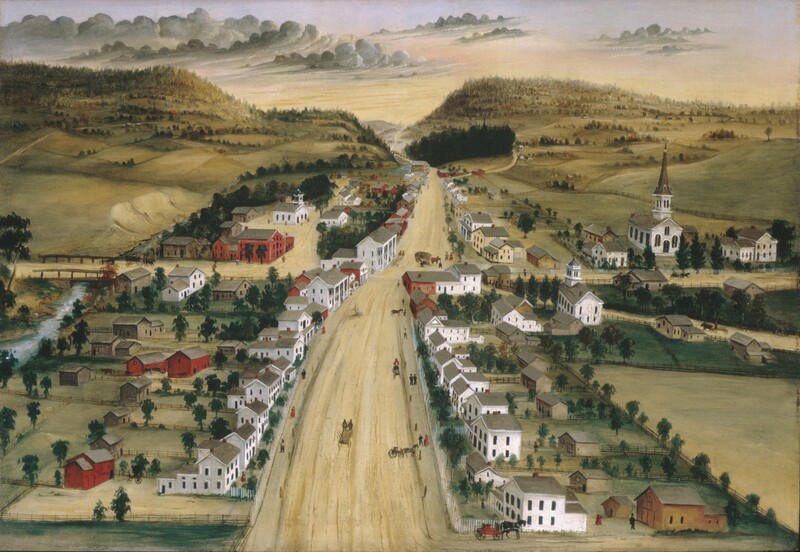 He painted a series of townscapes of Poestenkill and the surrounding villages, applying an aerial view and incorporating clearly defined, recognizable buildings in his compositions. Here, the aforementioned church, next to which Hidley lived, is the most prominent structure. Poesten Kill—“kill,” from the Dutch, means “creek”—can be seen both in the left foreground, where it passes under a bridge, and in the far distance, where it spills over a dam. The town was an important lumbering center, and many mills were located along the creek.